Identification: This ornate aeolid has a transparent body sprinkled with opalescent white flecks. The cerata are strongly inflated with low tubercles and are ringed subapically with dark yellow, light blue, purple and light yellow bands. The rhinophores are covered with long papillae. Natural History: Eubranchus mandapamensis is a rare species that has been found in exposed rocky locations. The few known animals were seen under rocks in 6-9 m (20-30 ft). It lays a cream-colored egg mass. Distribution: Maui and Pearl & Hermes Reef: widely distributed in the Indo-Pacific; also in the eastern Pacific. Taxonomic notes: It was first recorded in Hawaii from off Makena, Maui by PF on August 20, 1990. It was named for the town of Mandapaman in India. 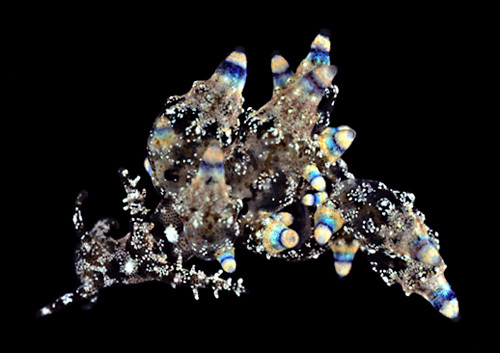 There's also some chance that the Hawaiian animal could be Eubranchus rubropunctatus, Edmunds, 1969 (based on its papillate, rather than annulate, rhinophores). Photo: PF: 6 mm: off Makena, Maui; August 20, 1990.